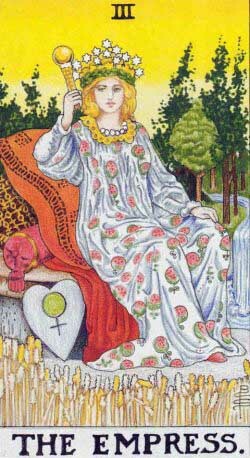 The Tower is the sixteenth Major Arcana of the Tarot. 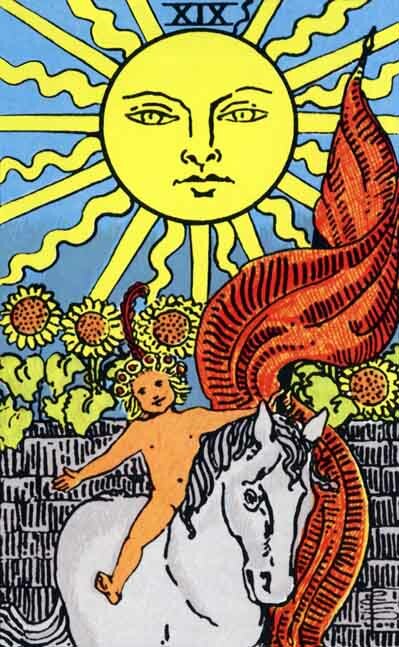 While in Rider-Waite tarot deck I simply The Tower, some old versions of 17th century tarot called it The Lightning – La Foudre. Probably inspired by this, Papus proposes an alternative name: The Lightning-struck Tower. Aleister Crowley proposes, for his part, another name: War. We show you how The Tower is interpreted by four important Tarot Masters: the British occultist A. E. Waite (1857-1942), the Russian mathematician and occultist P. D. Ouspensky (1878-1947), the English occultist and ceremonial magician Aleister Crowley (1875-1947) and Spanish-born French occultist and founder of the modern Martinist Order, Papus (1865-1916, his real name being Gérard Encausse). When speaking about the divinatory meaning of the Greater Arcana, Waite offers this list of possible meanings, for the Tower: „Misery, distress, indigence, adversity, calamity, disgrace, deception, ruin. It is a card in particular of unforeseen catastrophe“. Reversed, the Tower can signify: „according to one account, the same in a lesser degree also oppression, imprisonment, tyranny“. In his chapter about the doctrine behind the veil, Waite warns hi reader that „occult explanations attached to this card are meagre and mostly disconcerting“. 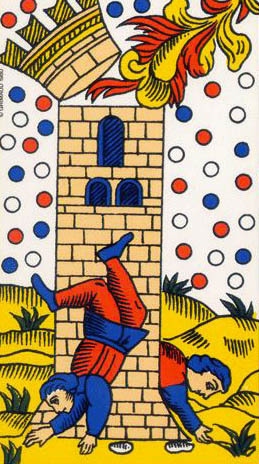 The author connects the Tower with the previous card – The Devil: „There is a sense in which the catastrophe is a reflection from the previous card, but not on the side of the symbolism which I have tried to indicate therein. It is more correctly a question of analogy; one is concerned with the fall into the material and animal state, while the other signifies destruction on the intellectual side“. Waite also remembers us an old truth: „except the Lord build the house, they labour in vain that build it“. „But by and by the disciples forgot the true covenant of the Master and what the tower symbolized, and began to believe in the tower of stone, they had built, and to teach others to so believe. They began to say that in this tower there is power, mystery and the spirit of the Master, that the tower itself is holy and that it is built for the coming Master according to His covenant and His will. And so they waited in the tower for the Master. Others did not believe this, or interpreted it differently. Then began disputes about the rights of the summit. Quarrels started, ‘Our Master, your Master,’ was said; ‘our tower, your tower.’ And the disciples ceased to understand each other. Their tongues had become confused. You understand the meaning here? They had begun to think that this is the tower of the Master, that He builds it through them, and that it must and, indeed, can be built right up to Heaven. «And you see how Heaven responded?»“. What about his real meaning? „The building of the tower was begun by the disciples of the great Master in order to have a constant reminder of the Master’s teaching that the true tower must be built in one’s own soul, that in the tower built by hands there can be no mysteries, that no one can ascend to Heaven by treading stone steps. The tower should warn the people not to believe in it. It should serve as a reminder of the inner Temple and as a protection against the outer; it should be as a lighthouse, in a dangerous place where men have often been wrecked and where ships should not go“. Aleister Crowley connects the Tower with the Hebrew letter Peh and with the planet Mars. In connection with Mars, the planet and the ancient god of war, the ceremonial magician also proposes an alternative name for this card: „The War“. He affirms that „ in its simplest interpretation it refers to the manifestation of cosmic energy in its grossest form“. „This suggests another (and totally different) interpretation of the card. To understand this, it is necessary to refer to the doctrines of Yoga, especially those most widely current in Southern India, where the cult of Shiva, the Destroyer, is paramount. Shiva is represented as dancing upon the bodies of his devotees. To understand this is not easy for most western minds. Briefly, the doctrine is that the ultimate reality (which is Perfection) is Nothingness. Hence all manifestations, however glorious, however delightful, are stains. To obtain perfection, all existing things must be annihilated. The destruction of the garrison may therefore be taken to mean their emancipation from the prison of organized life, which was confining them. It was their unwisdom to cling to it. The above should make it clear that magical symbols must always be understood in a double sense, each contradictory of the other. These ideas blend naturally with the higher and deeper significance of the card“. 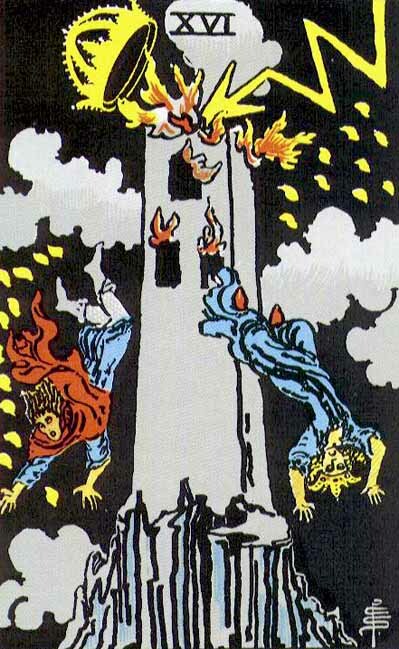 The French occultist also proposes (as Crowley did) an alternative name for this card: The Lightning-struck Tower. He explains it as it follows: „Here it signifies the invisible or spiritual world, incarnated in the visible and material world. 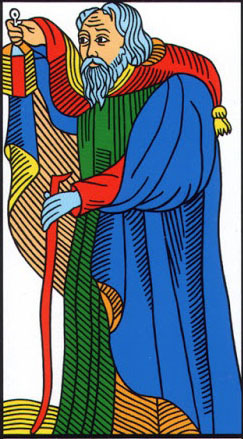 The 16th card represents the material fall of Adam“. It is interesting that Waite himself refers to this interpretation offered by Papus: „I see nothing to warrant Papus in supposing that it is literally the fall of Adam, but there is more in favour of his alternative–that it signifies the materialization of the spiritual word“. Materialization of God the Holy Spirit – entrance of the Holy Spirit into the visible World. The Holy Spirit acting like the God of matter. – DIVINE DESTRUCTION. The materialization of the Adam-Eve, who have been spiritualized until now. Entrance of the Adam-Eve into the visible World – THE FALL. Materialization of the Universe-principle – THE VISIBLE WORLD. 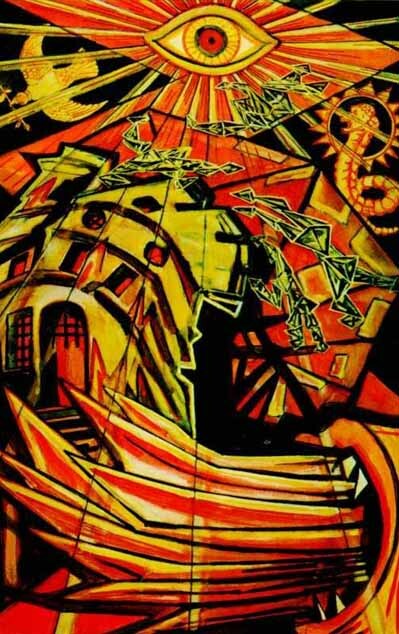 Share the post "The Tower – Major Arcana Tarot Card Meaning, according to Waite, Ouspensky, Crowley and Papus"